The three piece harp transport cover is essential gear for harp moving. If you play your harp for any length of time, someone is inevitably going to ask you to bring it to play at their wedding or other social function. If you’re not used to harp moving, the prospect can seem daunting. But with a little knowledge and preparation, you can take your harp anywhere you want. There are several aspects of harp moving that I intend to cover in future articles, but for now I’d like to discuss the merits of investing in a three piece transport cover. When new and used harps are sold, they often come with a lightweight dust cover, made of a thick fabric such as canvas which is designed primarily to keep harps from getting dusty. Some basic covers, such as the black ones that currently come with new Lyon & Healy harps, offer a thin layer of padding underneath durable fabric. While any cover is better than nothing when transporting your instrument, none of these provide the ideal amount of protection from trauma and the elements as full transport covers. Transport covers typically come in three-piece sets: a base cover, a column cover, and the big mitten-shaped harp cover. Lyon & Healy and Salvi Transport covers are various shades of blue. Most of the Venus covers I’ve seen are black, while Camac seems to prefer a shade of maroon. No matter the color, it is the additional protection of the separate pieces, especially the bass cover, that I recommend investing in if you plan to move your instrument with any regularity. The transport cover has dedicated sections for the column and base, as well as a main cover. Loading a harp in your vehicle often involves tipping it over and laying it against the tailgate before lifting it in. As you pivot the harp on the pavement where you are parked, the harp is vulnerable to scratches and scrapes from the road. If it is raining or snowing as you load your harp, you have the added problem of moisture getting on your harp’s base. Using a base cover will protect the harp from both the vagaries of pavement and the elements as you get it into your car. What I just said about the cover goes for the rest of the harp as well. Transport covers offer additional padding and protection from the elements. They also zip more securely over the column, whereas the basic covers often close with a Velcro strip. Using a transport cover will cut down greatly on wear and tear as you move your instrument here and there. A floor mat or carpet remnant can help protect your harp from pavement during loading. If a transport cover is something you simply can’t afford right now, or you almost never move your harp (except for your regular regulation appointments, I hope! ), there are ways to safely move without a transport cover. Your first concern is protecting the base as you pivot into the vehicle. The best way to do this is to put down a carpet remnant or floor mat and set your harp on that. This will minimize any scratching from the pavement and may offer some protection against moisture as well. The second concern is padding. If you can’t put a padded cover on the harp, put padding in the vehicle. A thin mattress and some strategically placed pillows can protect it from harm and soften the bumps in the road. Don’t overdo the padding, though. You don’t want the harp on a big pile of fluffy pillows that will render it unstable. Sure, you can get by without proper covers, but I recommend doing so only until you can save up enough money to buy them. They will protect your harp and make your moves more hassle free. And you’ll never get tired of people asking you why you’re moving a gigantic oven mitt! Okay, that’s not true. You’ll get tired of that pretty quickly. But get the cover anyway. I said so. PS: No one paid me to write this article, and I don’t earn a commission from anyone when you buy a cover. I recommend them because I think they’re worth owning. See you on the road! 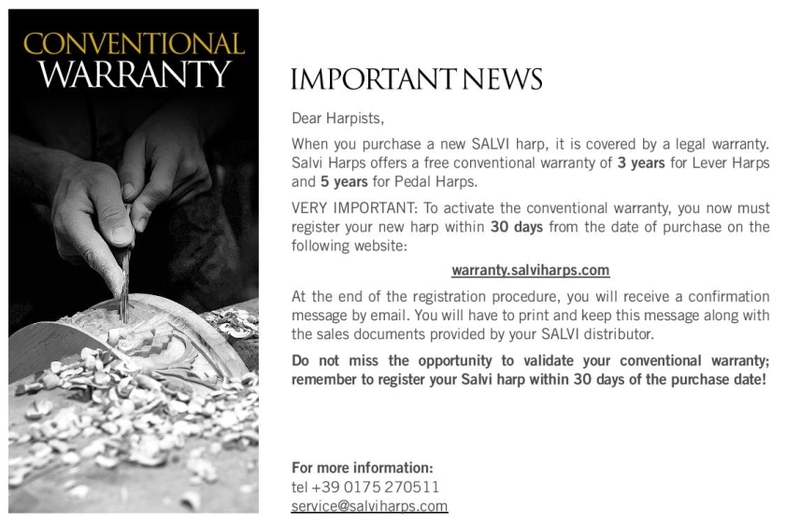 Attention recent and future Salvi Harp buyers. The company now requires that new instruments be registered within 30 days of purchase in order to be covered under warranty. Visit the following site to register: https://warranty.salviharps.com.